Anmar Solutions provides in-depth microwave leakage testing services, all of which are in line with the requirements of both AS/NZS 60335.2.25 and AS/NZS 3760:2010. 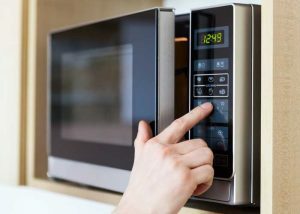 Unfortunately, microwaves can be easily damaged, particularly in a business environment, such as a busy office, where it is used consistently throughout the day. The simplest of problems can cause microwave leakage, from slamming the door of the oven, dirty door seals and hinges, and even just wear and tear. All these problems can cause the door of your microwave to come loose from its enclosure. If this happens, harmful radiation can leak through the gap that is left behind. When a microwave is switched on, it emits a High Frequency Radio wave. It is this wave of energy that actually makes water molecules within food to vibrate at extremely fast pace. This vibration produces heat, which then cooks your food. The problem is that the High Frequency Radio waves can be harmful to human health because they have the power to penetrate living tissue. As soon as your microwave is switched off, the radiation dissipates but while your microwave is on, you can be exposed to radiation leakage. Given that all employers are responsible for providing a safe workplace, Anmar Solutions generally recommends that microwave leakage testing is undertaken on a regular basis, potentially once a year. Anmar Solutions conforms to all electrical, microwave, safety and inspection standards outlined in both AS/NZS 60335.2.25 and AS/NZS 3760:2010. Our customer service is first-class, and we pride ourselves on our attention to detail and high quality workmanship. We are 100% committed to delivering your job on time, and on budget—every time. We provide pricing structures that cater to multiple organisation types to ensure that safety standards can be met at any scale.